Batman: Arkham Knight, developed by Rocksteady is without a doubt the biggest Arkham game to date, but it is also perhaps the deepest and most rewarding one the developer has created yet. However, Rocksteady didn’t listen to the old mantra of; if it ain’t broke don’t fix it, and forced in certain aspects which make the game frustrating, and at times a step in the wrong direction when traditional Arkham games are considered. This time around, Gotham City is in pearl from the fear inducing Scarecrow and his mysterious right hand man, The Arkham Knight. Both these criminals have their own agendas and both involve the caped crusader. 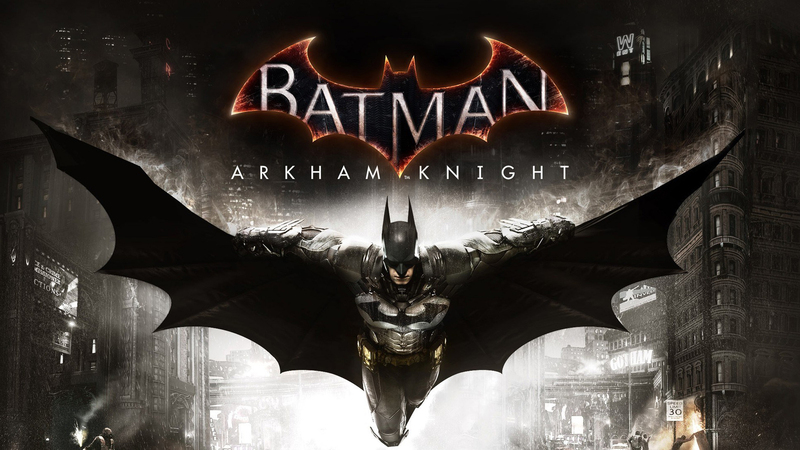 Batman: Arkham Knight sees you the player glide, drive and fight your way across the biggest Arkham sandbox yet, and nearly all of Batman’s most feared foes are out, looking to cause as much mayhem as possible. Something that’s clear from the outset of the game is how Rocksteady has clearly benefited from the step up in platform power. Not only is Arkham Knight a big game, filled with a wealth of things to do, but it is also the most visually striking of the games. Back is the unique art style of game, but it is now enhanced, making this the prettiest Arkham game yet. As always with Arkham games, it is the gameplay that is the big standout, and is one of the main reasons that these games are as popular as they are. When it comes to the gameplay that fans have loved and played for 4 games now, Rocksteady have just improved and refined on their oh so sweet formula. Without a doubt the combat and the stealth sections of Arkham Knight are some of the tightest and most well put together of any game yet. Combat feels as fluid as ever and the addition of some new, and more challenging enemy types, has helped keep things fresh. What I loved the most about the combat aspect of the game though, is that Rocksteady knew they had this part of the game down and so they didn’t tamper with it in any way. Instead they have just simplified things that were clunky in previous games, and they’ve added some new, rewarding toys, all which go towards making their style of gameplay all the more fun. The same can also be said for the stealth missions, which usually make up the other parts of this game. Though it seemed like there wasn’t as many as previous Arkham games (which is a shame) Rocksteady did the same with these as they did with the combat. Things are slightly adjusted, and some new, helpful toys were added, all with the goal of refining what they already had, and giving fans more of what they wanted. I feel it’s important to add that though Rocksteady didn’t do much in the way of altering when it came to the classic gameplay of the Arkham games, they very much surrounded the gameplay with new and exciting set pieces. You will have the opportunity to use these gameplay elements in never before experienced situations/locales. Also the continuously rewarding nature of the gameplay, coupled with the scenarios it puts you in, all make for some great times. Now though, I feel it’s time to talk about the elephant in the room, that elephant is of course the Batmobile. I have a love hate relationship when it comes to the Batmobile in Arkham Knight. There are points in this game where I love being able to barrel my way through the city and apprehend rioters, but there are times where I want to be doing any other of the gameplay aspects (most of which I’ve spoken about already) than have to be doing another mandatory Batmobile mission. Getting into the nitty gritty of my main issue with the Batmobile, the problem with it is that it is used too often and quickly takes over the majority of the story missions, leaving large gaps of play where you are not getting to do the things you love to do in an Arkham games. Now this is primarily a problem with the structure of the story missions (not the story itself, which I will touch upon in a moment) where so much of it has been designed for the player to have to use the tank portion of the Batmobile, and not be given the option to complete the missions in any other way. It gets to the point where if you only did story missions and never once touched the side quests, you’d spend between 70 to 80% of your time sliding around a courtyard, blowing up unmanned tanks. Don’t get me wrong, there are times when it’s fun to be in charge of a transforming Batmobile, one that goes from a super car to a tank, the problem is that you’re doing it so much, and it is taking the place of the traditional Arkham gameplay, that it can become a little frustrating after a while. It’s a shame because outside of the story missions there is a lot of fun to be had in the Batmobile. Speeding your way through the streets of Gotham, chasing down a Riddler informant, forcing his car off the road, interrogating him for the necessary information, and then jumping pack in your beautiful looking Batmobile and continuing on with your mission of saving Gotham is an experience that doesn’t get old. Rocksteady didn’t get it wrong when it came to the controls of the Batmobile, it can be really fun to drive around in, and it can also be really rewarding when you dispatch with a large group of enemy tanks. The problem is that they use it so much; they force it so far down your throat that the rest of what makes Arkham games so much fun seems to be forgotten about, relegated to the majority of side missions, rather than dominating the majority of the games… well gameplay. Outside of the large number of Batmobile missions there are still plenty of things to do around the vast Gotham City. The streets are filled with side objectives, all which are so varied; you’ll certainly get your fill of the gameplay you’ve come to love. Also seeing its return are the Riddler puzzles, which in this game are the most varied of any Arkham game yet. There is every kind of puzzle that you’ve solved in previous games, in this one and there also some new ones for your brain to tackle. Though the story missions don’t always supply you with the game elements that you want, Rocksteady made sure to fill the rest of the game up with all sorts of fun and rewarding challenges. About that story and the missions that have too much Batmobile, no spoilers of course. To put it simply, the story in Arkham Knight is perhaps the best yet. The characters it utilises and how it uses them, the evil plot that Scarecrow plans to enact, the semi-allies that he has helping to cause chaos on the streets of Gotham. Everything within the story comes together to deliver the deepest and most emotionally eye opening tail for Batman (and others) yet, whoever it was over at Rocksteady who penned the story for Arkham Knight, bravo. If anything seeing how the story plays out, witnessing the fate of many of the characters who have been in these games from the beginning, makes having to play through the barrage of Batmobile missions very much worth it. From everything that Rocksteady has been saying, Arkham Knight may be their swan song in the Arkham universe. If that is the case then I think they have done an admirable job. There is so much to love in Arkham Knight, and yes there are aspects to not love as much but Rocksteady still certainly raised the bar for any future Arkham Games (from whatever studio will more than likely take them on) and also raised the bar for these types of games. I would absolutely recommend Batman: Arkham Knight. The Batmobile is certainly an issue within this game, but it isn’t something that should turn you away from playing it. Arkham Knight has a lot to offer and in my personnel opinion, it definitely delivered.